Description: Sublettered for CSX, 8320 leads a coal train near Allendale, SC. Description: CSX 8204 rounds the connector track moving from the ex-C&WC/ACL/SCL route to what is now the CSX S line at Fairfax with a coal tain headed south in 1990. Description: CSX 7625 leads a manifest near downtown Montgomery. Description: Next time I'll try it with better lighting....if CSX cooperates! Description: Q667 at 19:17 hrs. 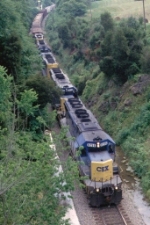 Description: CSX B75621 with 50+ cars struggles to make the grade. Description: CSX B75621 heads south. Description: CSX B77922 bringing a B755 train north to Massena has to stop for a meet with Q62022. Description: CSX B75627 heads south to DeWitt. Description: CSXT Q202-29 with autoracks and pipes. Q202-29 is just ahead of Q202-30. Description: Getting the green at a signal east of the Goodman St. yard these two head east on the main. Description: a CSX freight heads west. Description: CSX 8204 does some sorting.